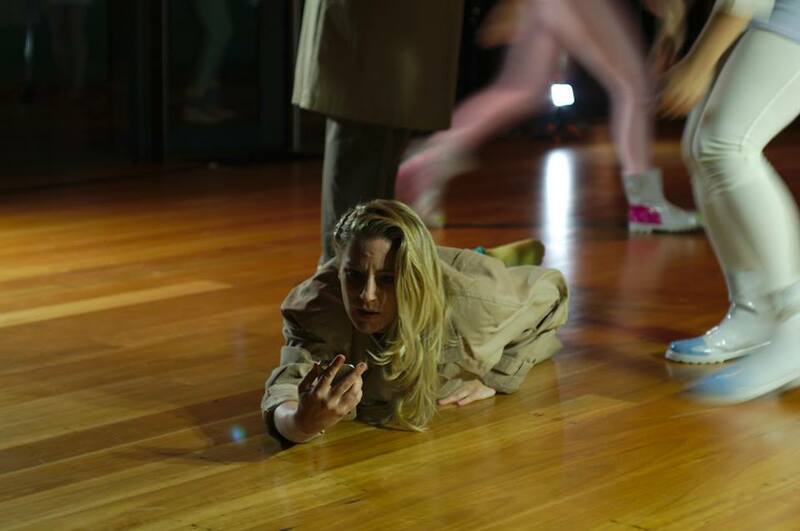 Zeroville is fascinating theatre, presented in the Glass Pavilion, Justice Precinct as part of the Anywhere Festival Parramatta. It’s a wonderfully engaging mix of genres – the hardboiled detective genre meets dystopian speculative fiction. In many ways it’s a natural marriage. Both genres have similar tropes. Both pit logic against some other element of human experience. In the detective genre, the D uses logic, but not the scientific clarity of Sherlock Holmes. It’s logic tainted with world weariness and informed by pessimism. In speculative fiction, scientific logic creates extraordinary worlds, but increasingly this genre suggests such brave new worlds are dystopian. And their flaws are due to logic itself. It’s logic that encourages faith in an all-encompassing-but-closed knowledge system, and it’s logic that creates the technology that can enforce control on a societal level. Considering it’s written by the ensemble and director, Zeroville has an almost unbelievable coherence. Director Michael Dean and designer Hugh O’Connor make brilliant use of the space. For all its simplicity, it’s a visual joy. And Benjamin Garrard and Jasper Garner Gore fill that space with an eerie evocative soundscape. Genre work is always intriguing, because it raises two questions. The tropes being obvious, one is clearly being asked whether the assumptions underlining these tropes are valid. Consider one example: In the world of our experience, do outside forces attempt to control our emotional lives? The simple answer is yes: Corporations stimulate desire through advertising. Governments stimulate fear through targeting marginalized groups. Of course, in dystopian fiction, this control is exaggerated. Perhaps hyperbole is in the nature of all fiction, but the exaggeration can raise another question: is it indicative of a desire to believe we are being controlled? What would be the appeal of such a belief? The eternal tussles are not simply between good and evil, but also between aspects of good. Freedom and responsibility are two such aspects of good which battle it out in our culture. The belief that we’re in danger of being controlled supports the ascendancy of the first of these aspects.